We headed from Ijen crater to Mt Bromo by car. By this time we had accepted some realities of life which had presented themselves during the trip. One was that our driver said ‘yes’ to everything we asked him and then went into a long pause during which his eyebrows became furrowed, perhaps trying to understand what he had said yes to. Second was that sleep was a luxury which we could not afford except for the few minutes we nodded off in the vehicle during our drive. Of course, the sleep was interspersed with heated conversations about Indian culture, politics, few random topics during which everyone got heated up without any concrete conclusions on the topic of the debate(gender wars being one of them) and the interpretation of the driver’s expressions and nods. We had a fair idea about our journey ahead. We were to reach our hotel which was quite near the sunrise vantage point from which Mt Bromo could be seen. In the month before the trip, I had seen two dreams of volcanoes erupting. I just hoped during the trip that it had something to do with the volcanoes which we often saw in Chacha Chowdhury comics, related to Sabu’s anger outbursts and not prophetic dreams about real volcanoes erupting. I informed the gang about the dreams I had been having and they brushed it off. I needed a clear conscience. If something were to happen, at least I could say ‘See, I told you so,’ to the gang, before we ran for our lives. Obviously you must have figured out that since I am posting this, the dreams had something to do with the aforementioned Chacha Chowdhury comics and not Nostradamussy dreams. But I wish the dreams I had few years back of beating Milind Soman in a race could come true. Sadly, that kind of dream coming true requires more effort than flopping into bed and letting the subconscious mind go crazy with its whims and fancies. The hotel we checked into was a decent stripped down hotel, with bare necessities well provided for. The hotels around the place were of a similar kind, adding to the rustic beauty of the place. After taking a shower, we headed to the restaurant for dinner. We carried some Maggi packets with us, just in case we didn’t get vegetarian food. I sat in a corner, waiting for the rest of the gang to figure out what was on the menu. When they came back to our table, they looked excited. “No,” my husband said, beaming with joy. “They have french fries on the menu,” he said. “That’s vegetarian food,” I said, beaming a little with joy. It is always good to not beam too much at the mention of french fries, because it is politically appropriate to show some concern for the calories contained in the little devils. “But they don’t have it,” he said. “They have vegetarian sandwiches on the menu,” he said. “Aha,” I said, my face lighting up completely. There is nothing politically incorrect with your face lighting up at the mention of sandwiches. “Why are you so happy then?” I said, not wanting to spark a discussion at that time about how happiness should spring up from inside as I often preach. “Maggi,” he said, his eyes sparkling. “They agreed to let us use the kitchen?” I said. “Aha!” I said, this time my voice heavy with anticipation. One of my friends entered the kitchen and the staff mesmerised by her beauty called her ‘Kareena Kapoor’. As she told me this, I could remember multiple Bollywood movies where the heroine walks into a room, her hair flying in a remarkably organised way and the guys in the room look like hypnotised goldfish. Back to reality, we started cooking the Maggi. Now, I would not like to comment on the state of the kitchen, because I am not Gordon Ramsay, but he would have passed out a few times on seeing the kitchen, each springing up back again to scream at the people handling the kitchen. As we cooked the Maggi, we could smell the jealousy of the people back in India where Maggi has been banned. P.S – Singapore gave a clean chit to Maggi almost as soon as the verdict of the ban came out in India. We endured the rather watery Maggi with a grateful heart owing to the choice of having something other than peanut butter bread along with chips of various flavours. Having swallowed down one bowl of Maggi each, we scurried to our rooms after being told by my husband that we had about 2 hours to sleep. We were woken up at 11:30 pm by my husband, who seemed extremely excited(and willing) to turn into a frozen popsicle by venturing to Mt. Bromo. I brr-ed my way out of the cozy warm bed. We headed to the Mt. 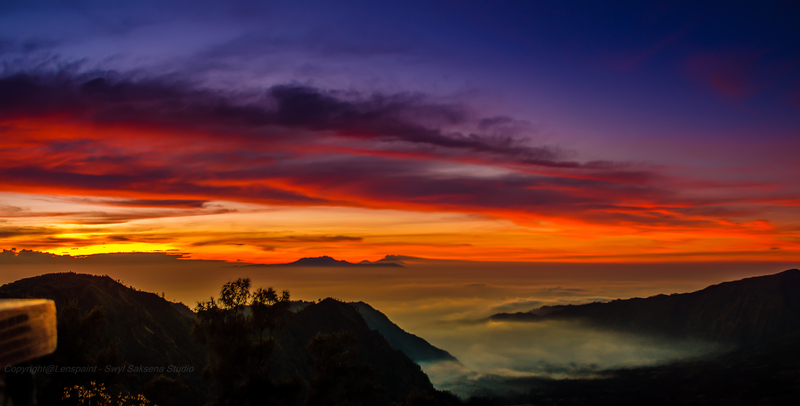 Bromo sunrise point. I can hear you informing me that sunrise doesn’t happen before 5:00 am anywhere in the world. In my defence, we went early to the sunrise vantage point to click pictures of the Milky Way around which the trip had been planned. As we got down from the army type vehicle which had carried us up the slopes, with us chattering our teeth like skeletons which had TMJ(a painful jaw condition which I suspect I have), we realised that the gift of sweltering heat had to be cherished once we got back to Singapore. Ah, I can feel the humidity all around me right now and it is golden. One of our friends had carried a blanket from the hotel, to brave the cold well-armed. I saluted her presence of mind. We reached the sunrise vantage point and sat down there shivering like jelly which had malaria. My husband looked around for the Milky Way, but it was nowhere to be found. Small tufts of cloud coupled with stars tricked us into believing that it was the Milky Way, but alas and woe. We headed back to our vehicle at the parking lot and huddled there. Slowly people started trickling in to the sunrise vantage point. I had realised the value of warm air in my life and was in the process of taking an oath of never going to any place cold ever! My husband who still seemed to be impervious to the cold weather, convinced us into moving our lazy and frozen bums down from the vehicle into the coffee shop which was 2 metres away. I decided to listen to him before completing the aforementioned oath. The coffee tasted like drops of magic from heaven, each drop invoking a fighter spirit in me. Finally as I took the last sip, I declared that it was time to see the sunrise and that shivering in the cold was for sissies. We walked up the stairs again, this time with hordes of crowd already jammed into the tiny space, with cameras and phones already in place for the sun’s grand entry. And there it was! The sunrise was like a gold chariot rising high in the sky, illuminating everyone around with its beauty, announcing its presence with valour and dignity, leaving us ordinary subjects spellbound, overawed, to the point of making us feel servile. Clicks went around everywhere. After a dizzying hour with all kinds of cameras, trying to capture the magical spell that the sunrise had cast, with clouds blanketing the land, owing to the sheer height that the photographs were being clicked from, it was time to leave. It almost seemed like the sun had reserved its most special sunrise performance for Mt. Bromo, her lover, seducing the volcano every morning with her enchanting beauty, making it and the thousands of subjects take notice. “Chal chaiyya chaiyya chaiyaa,” he started singing. We left the place with a smile, having seen one of the most beautiful performances of nature followed by a reminder of the fan following of King Khan. I remembered the song ‘Chaiyya Chaiyya’ as we boarded a train that afternoon, hoping we would not be expected the clamber onto the roof of the train and dance like King Khan. Thankfully, we just snoozed throughout the train ride, waiting for our next destination- Yogyakarta.